The Disk System was an add-on for the Family Computer (if you would never have guessed), released only in Japan. 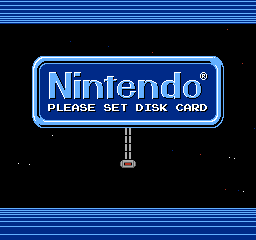 Games for this system were released on distinctive yellow floppy disks. Or sometimes blue. Probably the most recognizable element, partly through its cameos in Paper Mario: The Thousand-Year Door and Tetris DS, is the "PLEASE SET DISK CARD" screen. While waiting for the player to insert a disk, Mario and Luigi (using slightly altered versions of their Mario Bros. sprites) change the color scheme and chase each other around. 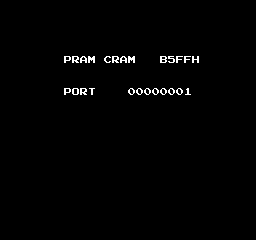 If you hold Start + Select during the boot screen and press Reset, a RAM check screen will appear. 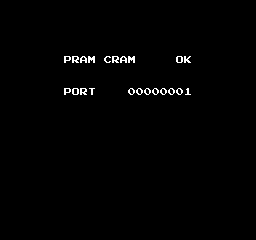 If no problems are detected, it will display "PRAM CRAM OK". If an error occurs, the address of the first memory cell where the error was detected will be displayed. 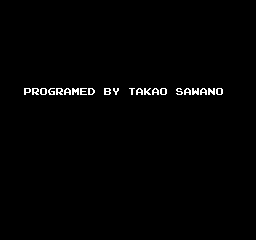 Use the RAM Check code above, but before the text appears on-screen release Start + Select then hold Right + A to see the programmer credit of Takao Sawano. This works on both the standalone unit and Sharp's Twin Famicom all-in-one unit, the latter of which otherwise makes no reference to Nintendo. 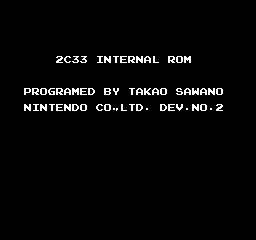 The original version of the standalone BIOS only includes the programmer credit; the newer revision features some space-saving code optimizations (including the removal of the code responsible for adding a drop shadow to the font, seen below) that allowed Sawano to add both the name of the ASIC and the team responsible for FDS development, Nintendo R&D2. Three versions of the FDS BIOS exist. 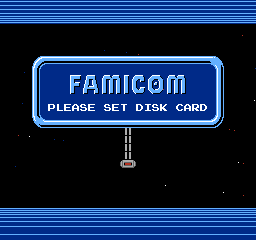 The ones used on the standalone unit display the Nintendo logo, whereas the Twin Famicom uses a generic "FAMICOM" logo, as Sharp removed most Nintendo branding. The newer revision of the standalone BIOS got rid of the heavy shading on the bottom edges of the Nintendo logo and the drop shadow behind the alphanumeric character set. This page was last modified on 6 August 2018, at 09:05.